Pokémon Ranger: Shadows of Almia is an action/role-playing video game developed by Creatures Inc. for the Nintendo DS video game console. 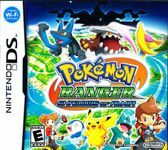 It is the sequel to the Pokémon Ranger video game, also for the DS. Much of gameplay is similar to the original game. Players must capture/befriend wild Pokémon to aid them by circling them with their Nintendo DS stylus (known as a Capture Styler in the game). Source: Wikipedia, "Pokémon Ranger: Shadows of Almia", available under the CC-BY-SA License.